Every September I get all antsy waiting for the fresh hop beers to come out. I go from pub to pub pestering the people behind the bar: "Is the harvest beer out yet?" Fresh hop ale was a great revelation the first time I tasted it at the Lucky Lab during my first autumn in Portland -- it was something I had never heard of before. A flyer on the bar at the Lab described how the brewers had driven out to a hop farm to get the fresh cones at harvest time so they could throw them into a batch of pale ale without drying them. Quite a wholesome idea, but the real proof is in the drinking. The herbal, or vegetal, or green flavor imparted by the fresh hops makes fresh hop beer truly special. This past autumn I really went crazy, with a goal of trying a new fresh hop beer every day. I didn't exactly succeed, but I enjoyed every day of the marathon, especially that fabulous Lupulin Ale from Full Sail. There were some misses also -- the Lucky Lab and Bridgeport really disappointed this year. I wish the Lucky Lab would go back to that golden ale that first hooked me, instead of the drab concoction they call the Mutt; Bridgeport's Hop Harvest is a lovely hop bomb, but so hoppy that the fresh flavor has gone missing. I prefer the lighter ale they brewed in years past. Being such a fresh-hop fiend, it definitely caught my eye when Jay Brooks' blog mentioned that Sierra Nevada was coming out with "two new fresh hop beers". Their new Southern Hemisphere Harvest Ale would be made with hops harvested in New Zealand, while it's still spring here in the US. That is some clever strategizing there, taking advantage of the spherical shape of the earth to get a second harvest ale out, six months before the West Coast hop harvest. It sounds too good to be true, and indeed it is too good to be true. From the description of the beer on Sierra's website: "the fresh hops in this beer are dried right after being picked". Uh oh. Have you seen the Fawlty Towers episode where the hotel guest insists on fresh peas for his omelet (at 9:30 in this YouTube clip)? Basil Fawlty tells him "I assure you they were absolutely fresh when they were frozen". When it comes to fresh hops, I'm that hotel guest guy -- the overly fastidious, impossible-to-please customer with the florid turns of speech. I don't care what hemisphere you're in, dried hops are not fresh hops. "Might I suggest that in future you avail yourself of sufficient quantities of the fresh article?" Even so, when I saw Southern Hemisphere Harvest at Belmont Station, I had to grab a bottle to try. Sadly, it was as I suspected: none of the great green fresh hop flavor. I even sprang it on Dave next door without telling him what it was, and he was as underwhelmed as I was. Not a huge surprise, really, the Sierra Nevada Harvest that came out last fall was also a dud. Neither of these beers even really had any hop-floral flavor -- like for instance Bridgeport's Hop Harvest does -- and the Southern Hemisphere has an unusual extra-bitter aftertaste that comes out several seconds after swallowing the beer. 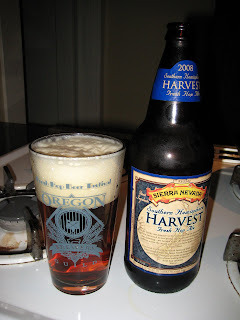 Not a totally bad bitterness, but definitely not what I want in a harvest ale. We're spoiled here in Oregon with our proximity to the hop fields -- getting the hops into the beer the day they're picked is an integral part of the flavor. In the case of the Southern Hemisphere Harvest, it sounds like it takes them about a week to get the dried-fresh hops into the kettle; even Sierra's regular Harvest has hops that were trucked across two state lines. But here's the good news: Sierra Nevada has started growing their own hops for use in a limited edition Chico Estate Harvest Ale. I can vouch for Chico Estate's potential: at Portland's Holiday Ale Festival last year there was a keg of Sierra Nevada made with their estate hops -- it was called 20th Street Ale then, not Chico Estate -- and sure enough, it had that special something that the wet hops provide. It sounds like distribution will be fairly limited, but I hope we get some kegs or bottles of Chico Estate up here.